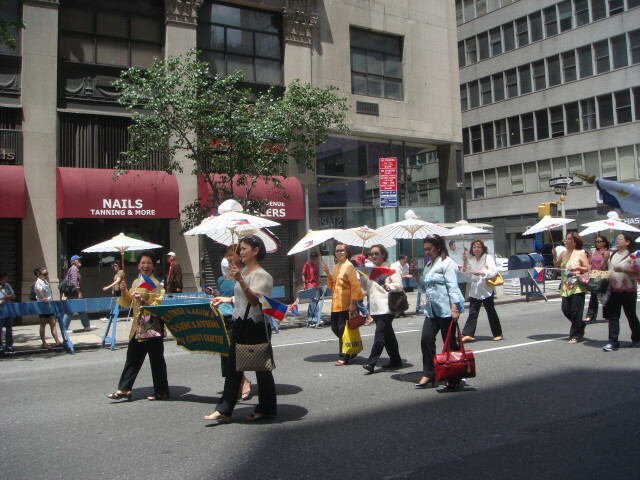 This is my second post on the Philippines Independence Day Parade (just like the title says). 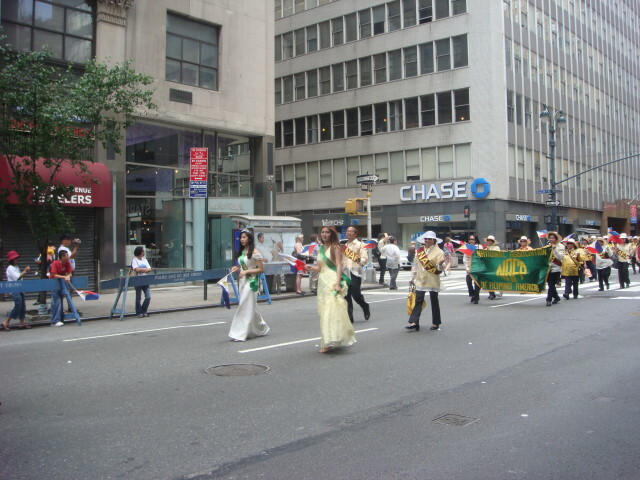 The parade was held on Madison Avenue and started at 41st Street and headed down to 26th or so. As pleasant as it was, it wasn’t a real crowded affair as the next two pictures will show. Here’s just to the south of me. 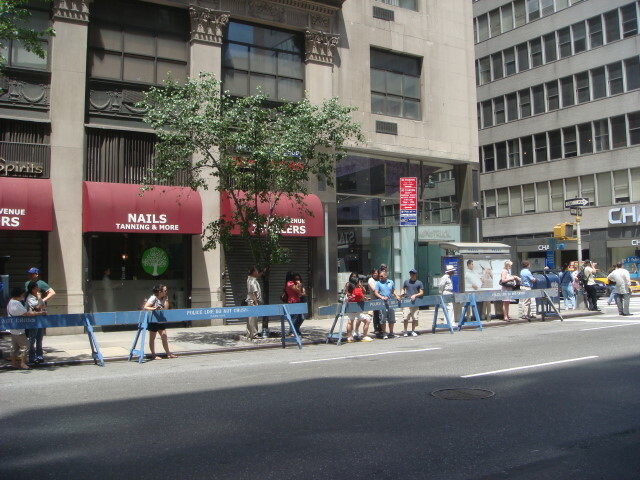 This was the crowd across the street from me. The next float was the only sign I saw of which liberation they were celebrating: the 110th Anniversary, which would make it freedom from Spain during the Spanish American War of 1898. 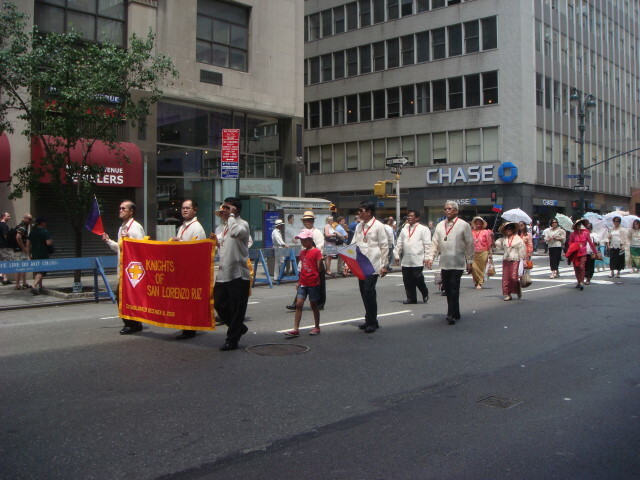 The Filipino Pastoral Ministry from Our Lady of Pompei Church in NYC. It’s kinda cool to have the Philippines, Italian, and American all cited in that title. The item the ladies are holding seem to be a doll of some sort. I presume its a Virgin Mary icon, but I just don’t know. The Knights of San Lorenzo Ruiz marched next. 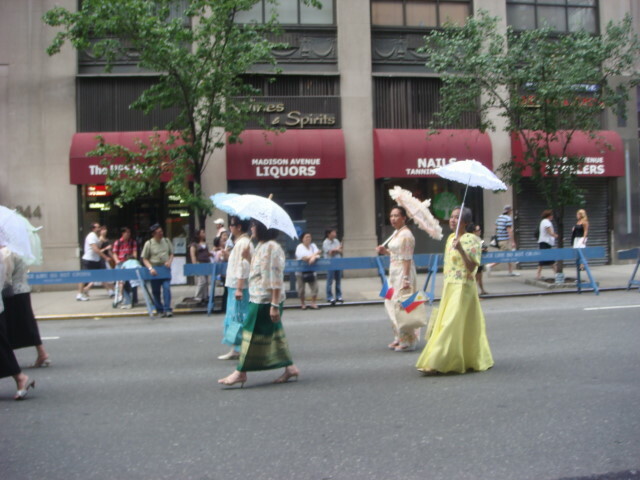 And they were followed by a bunch of Ladies with Parasols! Thank you, ladies. Another beauty queen in a car. I just wish they had it marked more clearly. Who’s supposed to read the hood of a car? 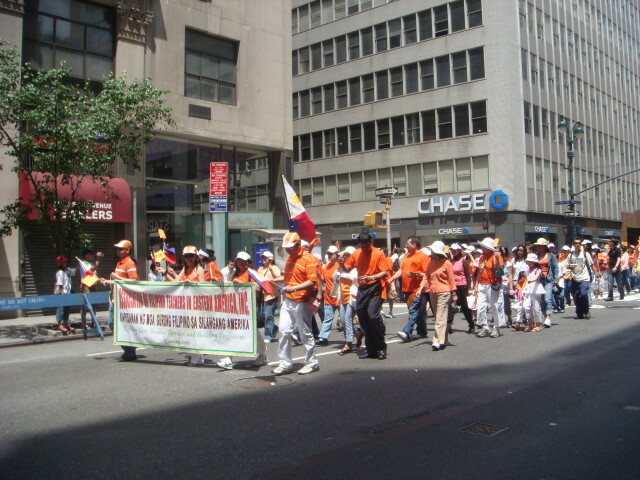 Below was the National Association of Filipino Americans, or NAFA. You know, I never could figure out when it was supposed to be Filipino or Philippino. Both spellings are used, but I never could figure out the rules for the use of it. Generally, it seemed, that when the appellation was applied to people, the “F” spelling was used. But I saw some exceptions to that and just ended up giving up on it. Woe is Famous Ankles. Well, at least NAFA had some beauty queens. Beauty queens from the Bronx. 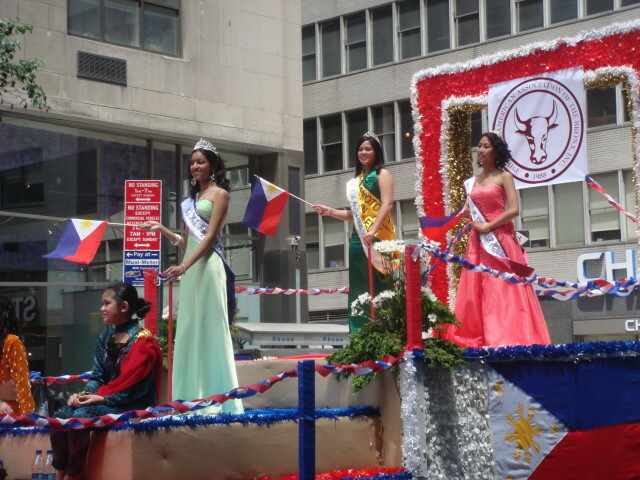 Well, beauty queens from the Philipino-American Association of the Bronx. 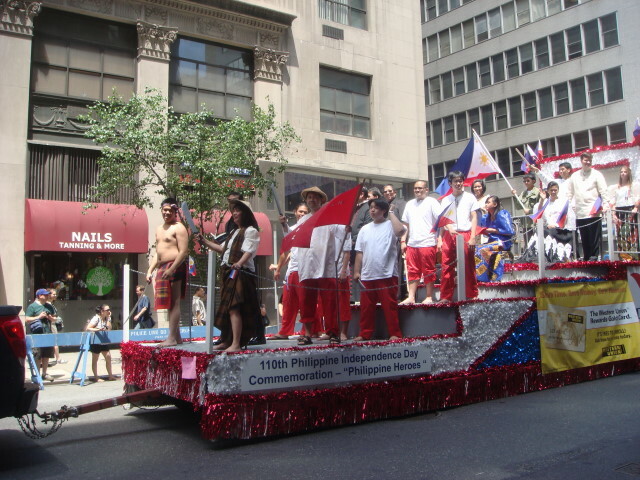 The Tanglaw Philipino Society of Suffolk County was the next group. C’mon ladies! Where are the parasols? 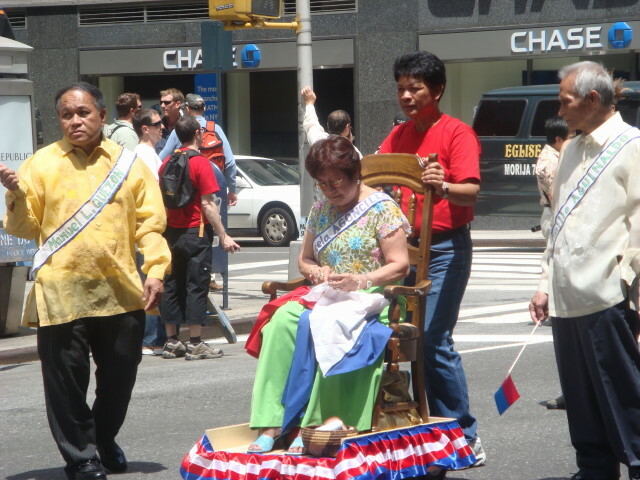 The most unique exhibit in the parade: a recreation of the sewing of the Philippines flag. 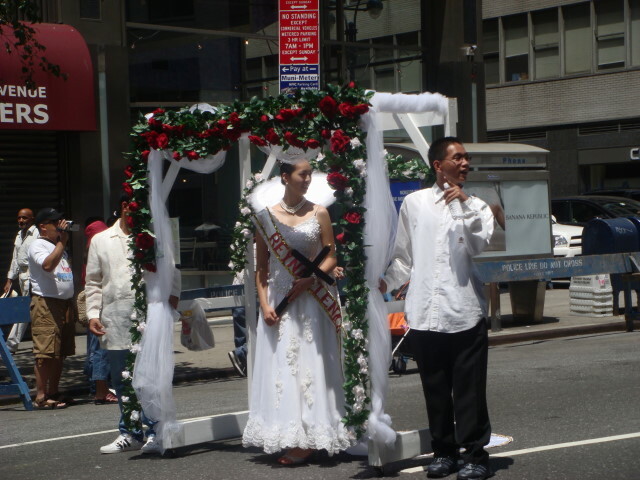 This was an interesting beauty queen concept: promote politician Jun Policarpio for Congress. The Association of Filipino Teachers; which just happens to have the same initials as the bigger teachers group. I really like the next picture. 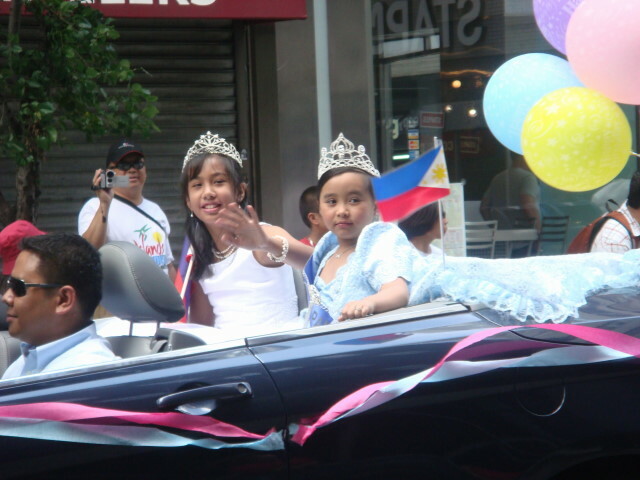 I put it on zoom and caught the two young beauty queens. 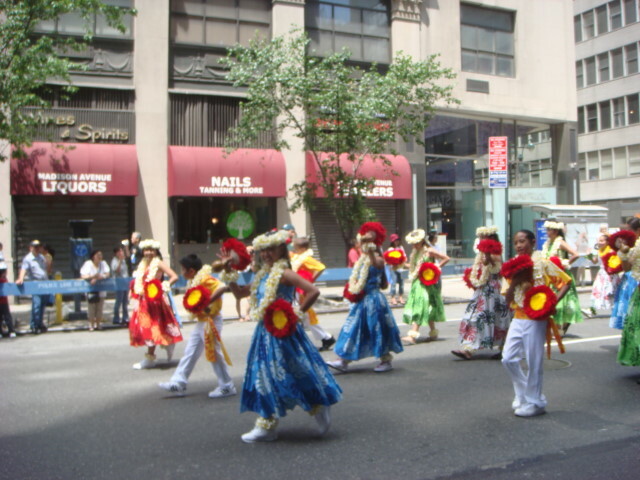 One of the few dance groups that were in the parade. 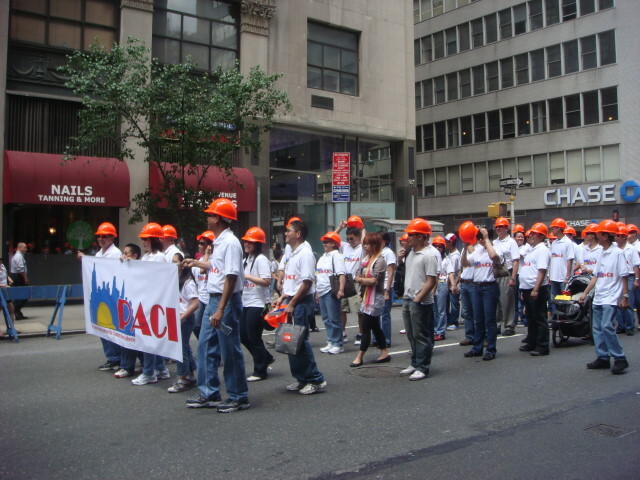 This is the PACI, which I believe means Philippine Americans in the Construction Industry. The Laguna Associations, or as I like to think of them; more Ladies with Parasols. When I first saw the next group, all I could think of was this was a delegation from New Orleans. Wrong! 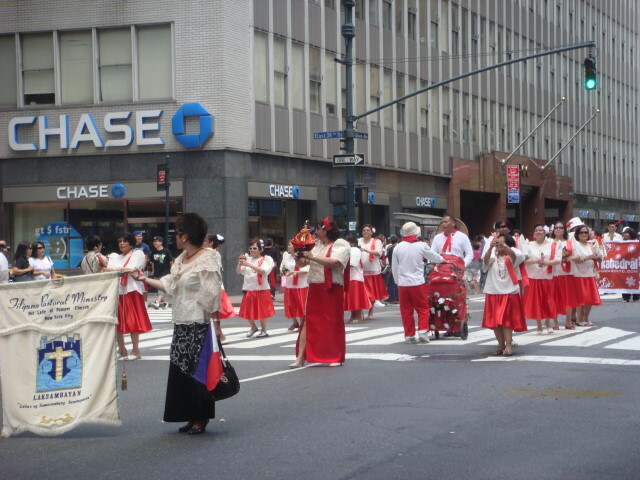 The Luisianians for the East Coast USA are from Laguna in the Philippines. The below beauty queens(?) were from Santa Cruz at Pistahan. 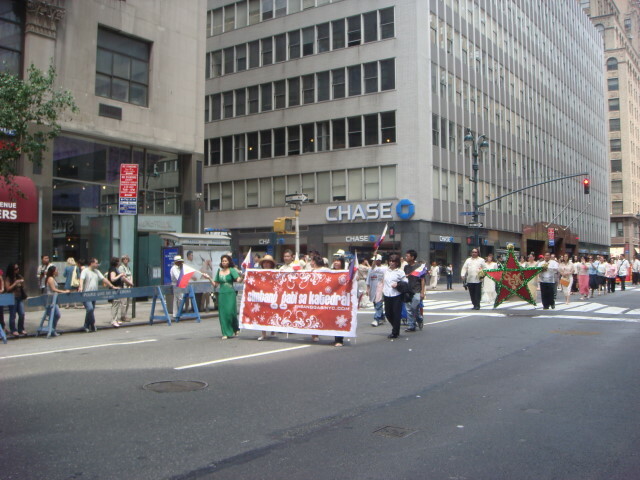 To be honest, I really didn’t understand the group but maybe they took advantage of the parade to wear their outfits. And a very interesting, even a wonderful set of young ladies who I can only think of as “brides” but I don’t know if that’s true. 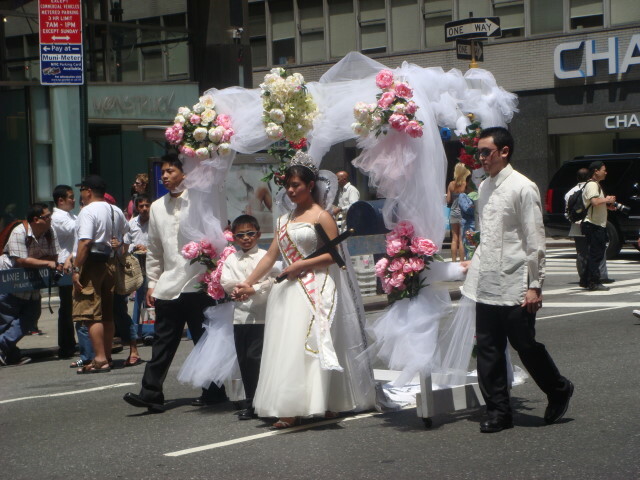 Each of them was walking with a movable structure and all of them had trains on their gowns. I tell ya, all I could think of them as was “brides”. The little girl next to this bride was a bit of a handful. I can’t imagine she walked the other 14 blocks or so of the parade. I don’t know what this group is, but it is the Cavite Association. 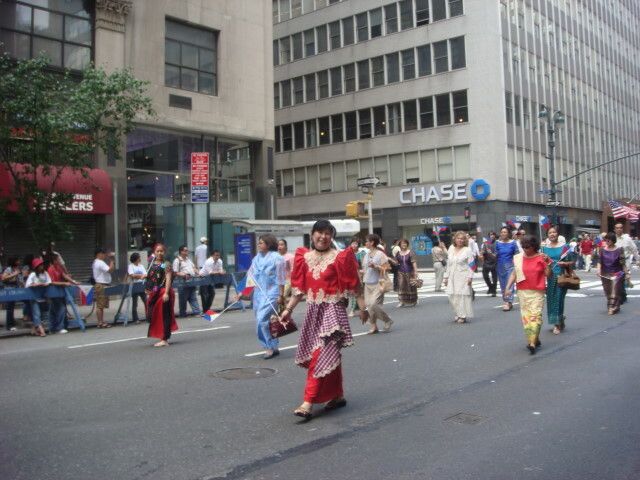 The next, and last picture of this post, is one of my favorite groups in all of NYC parades. 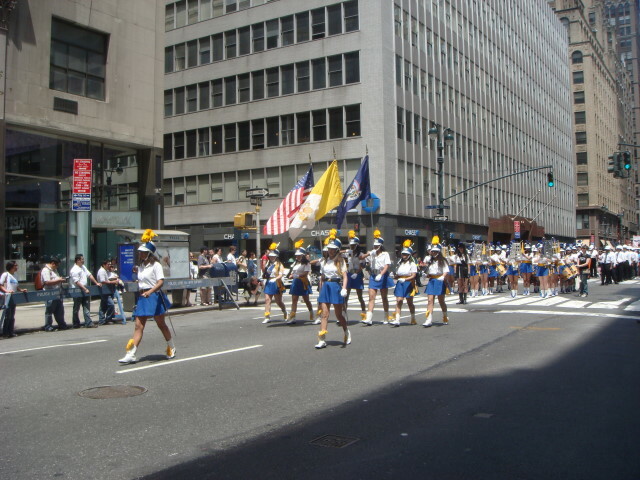 Ladies and Gentlemen, allow me to present the hardest working ladies in NYC parading: the Mother Cabrini Marching Band. These girls are in so many parades it makes me goggle. 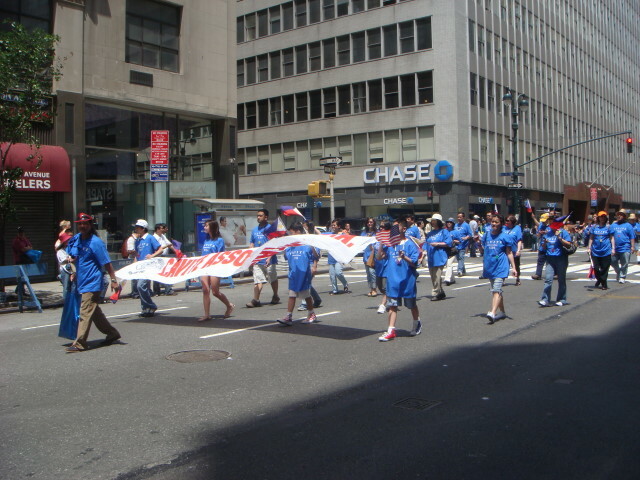 From now until Fall, they’ll march practically every weekend. I hope they all get full scholarships to the best schools around. They sure work hard enough for it. 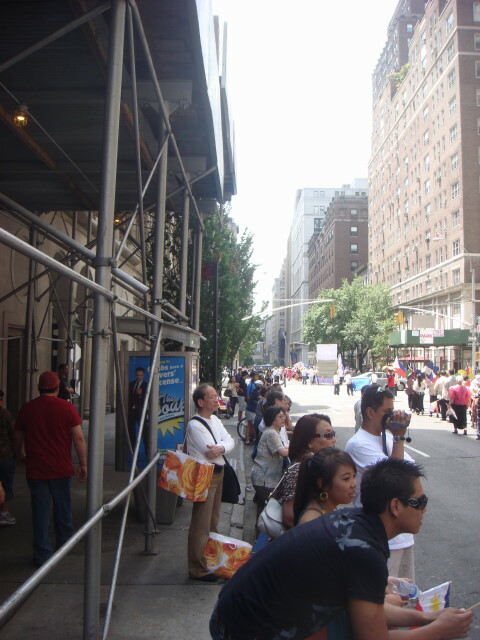 This entry was posted on June 4, 2008 at 6:43 pm and is filed under Uncategorized. You can subscribe via RSS 2.0 feed to this post's comments. You can comment below, or link to this permanent URL from your own site. The “brides” are actually “Reyna Elena” or Empress Elena who is the mother of Constantine. This image depicts the finding of the “true cross” that Jesus was nailed on. Your first image was the most accurate with the little boy depicting young Constantine. Constantine as you may or may not know is the first Christian emperor of Rome in 303. 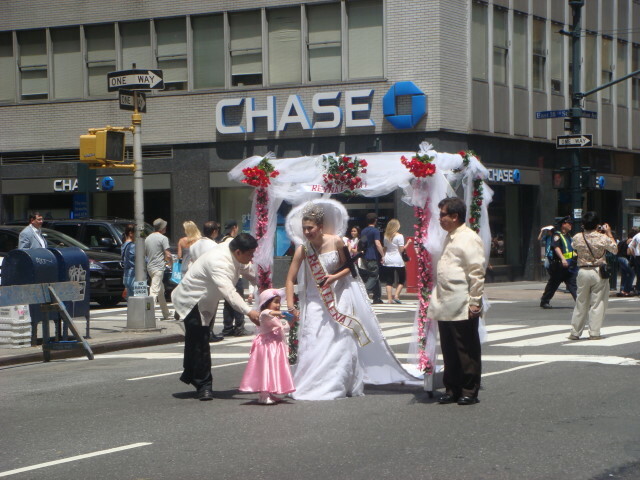 This is a traditional spring festival held in the Philippines.